So often a UK airshow report will start with a comment on the weather prevailing at the time of the event due to its effect on the day's proceedings. This on Duxford's Spring airshow is sadly no exception, as the strong gusting winds had the final say in what displays would take place during the day, beyond anything the organisers or crews could control. 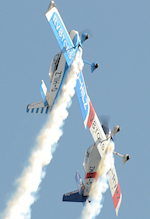 The planned content had intended to be one of the most mixed of shows for many years, to include a wide ranging contribution from the female-flown airshow community. The fact that a number of such items were of the lighter type of machine sadly meant that the show's subtitle became somewhat diluted. Phil Whalley braved the Duxford dust-bowl for UKAR. Additional photography by Ian Matthews. The early news from RAF Coningsby that the BBMF had cancelled was of little surprise, nor many of the other items. The lightest of these would have been multi-record holder Judy Leden MBE flying a hang glider, to be towed into the air by Shelley Smith in a microlight. Like many of the day's planned participants this would have been a rare appearance, brought to the event by virtue of the show's theme. Other types staying on the ground - and in some cases pulled back into the safety of the hangars - were various de Havilland products, a Ryan PT-22, a Chilton DW1, the eagerly anticipated Hawker Nimrod pair, a Jungmann, a Piper Cub and a Vans RV-6A, most of which would have been flown by women. In an extended pilot's briefing the show team did their best to produce a full afternoon's flying, pulling in a few replacement items where possible. In fact the show that was the eventual outcome proved to be a little gem, with the weather proving to be better than forecast as far as rain and cloud was concerned. For the photographer the strong, gusting wind played havoc with the longer lenses, but did help to break up the clouds allowing for some reasonable patches of blue at times. The first aircraft to brave the conditions was the RAF display Tucano flown by Flt Lt Dan Hayes. The silver and patriotically-flashed trainer produced a display clearly designed to show off its special scheme, which was debuting at the show. 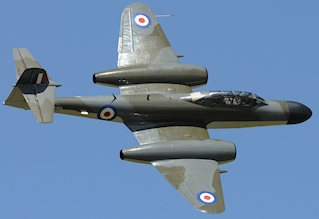 The first of two classic jets followed as Air Atlantique's Gloster Meteor NF.11 flown by Dan Griffith produced wingtip streamers during a highly energetic routine. This really is a glorious looking machine, and one of a number of highlights of the show. Dan made good use of the clear blue areas of sky, using plenty of vertical manoeuvres, against a towering cloudscape backdrop. Later in the day the Golden Apple F-86A Sabre took to the air in the temporary tiger scheme applied for the NATO Tiger Meet. As explained in UKAR's coverage of the event it is flying as such in honour of Cliff Spink, one time OC of the RAF's 74 'Tiger' Squadron, and displayed by the man himself. It's a scheme that has met with a mixed reaction, but anything that is a change from the norm always adds that extra bit of interest. The last jet aircraft of the day contributed to the feminine theme as Hawk display pilot Flt Lt Juliette Fleming put her aircraft through its routine. The special schemed 2011 display Hawk wasn't ready in time to 'show' at Duxford so 'Jules' had to make do with a standard black aircraft. Alastair Kay, normally to be found at the helm of a warbird, was joined by Andy Hill to make up the 'RV8tors', flying an aerobatic pairs routine in their Vans RV8s, which was a late addition to the schedule, as was the stunning RNHF Sea Fury T20 which appeared as a replacement for the absent Swordfish and was flown by Chris Gotke. The big radial fighter looks particularly smart in the blue, and sounds awesome! It was the warbirds that really made the day, and two in particular lifted the event to one to be remembered - both from the Fighter Collection stable. The P-40B Warhawk managed to survive the Japanese attack on Pearl Harbor, but not the paperwork issues that have hampered TFC's operations in recent years. The Warhawk hadn't been seen since 2008, so Pete Kynsey's display was extra special indeed. Stephen Grey flew the equally badly missed Curtiss Hawk 75A - another victim of the restrictions forced onto the TFC fleet - in a similar routine to that which he carries out with the Bearcat, showing the qualities of this earlier generation fighter. Some familiar warbird pairings flew during the day. ARCo's Buchon and Hurricane were followed by OFMC's Spitfire and Mustang, whilst a themed pairing of Carolyn Grace in her two seat Spitfire and Anna Walker in Kennet's Seafire added greatly to the day. A number of solo women did make it into the air in lighter machines of varying types. 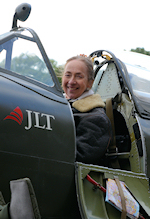 Much-flown 'aviatrix' Polly Vacher made some sedate passes in her famous orange Piper Archer, whilst Zan Blundell in a Yak-52 and Tizi Hodson in a T-67 Firefly did their best to impress in the rough conditions. 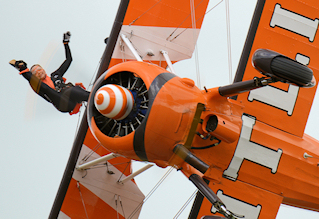 More serious and extremely notable aerobatics were flown by champion of the art Dianna Britten in a Cap232, whilst the familiar Breitling Wingwalkers added to the girls score. By the end of the display you really wouldn't have known that so many items had been lost from the programme. It was a real battle against the elements, which echoes fittingly with that of the show's theme of women's battle for equality in aviation. Congratulations are due to everyone involved.